Welcome to the sixty-ninth issue of MetaboNews, a monthly newsletter published in partnership between The Metabolomics Innovation Centre (TMIC, http://www.metabolomicscentre.ca/) and the international Metabolomics Society (http://www.metabolomicssociety.org/), to keep metabolomics researchers and other professionals informed about new technologies, software, databases, events, job postings, conferences, training opportunities, interviews, publications, awards, and other newsworthy items concerning metabolomics. MetaboNews represents the one-stop-shop for the very latest and most critical news about the science of metabolomics. In this issue, we feature a Database Spotlight article titled "Exposome Explorer: A new database on biomarkers of exposure", and a metabolomics interview with Kati Hanhineva of the University of Eastern Finland. 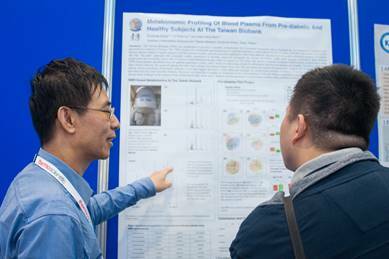 The deadline for abstracts to be considered for oral presentation is now past; however, you still have an opportunity to be considered for poster presentation if you missed the original deadline. Reviews are underway to select oral presentations and notices will be sent out by early May. Two Student Photographers are needed to document the sessions and capture the atmosphere of the meeting. If you have experience with photography, and you would be interested in this opportunity, we welcome your application. Photographers must have their own equipment and supplies. The two selected photographers will each receive a $500 USD Travel Award. Availability – are you able to attend all four days of the event? If selected, you will be able to coordinate with the other photographer to create an even mix of photography time and session participation. An exciting line-up of workshops is being developed for the conference in Brisbane. Below is the current list of workshops scheduled for Sunday and Monday, June 25 and 26. For the complete schedule and descriptions, click here. This was another long telephone conference (TC), in part reflecting the busy period in the Society's year; indeed, I even got a telling off from a Board member for not keeping us to time! As I mentioned in my last 'words from the chair', we've been dealing with the elections of the honorary fellows and this year it’s been a close election requiring another round of voting. As I type, I can't yet announce who has been elected but can say we had some excellent candidates, which has generated a lot of debate. The topic that most loomed large at the TC was the international meeting coming up in Brisbane, Australia. Preparation is in full swing. I am aware from members in Europe and North America that travel costs are high but I would urge you to come, and, for those of you that are students and early career scientists, I would encourage you to look at the bursaries both the Society as a whole and the EMN are advertising (Stacey and company appear to have found some money 'under the sofa' to help EMN members to attend!) I would also like to say that it's very important for our Society to be truly international. We have recently revamped the International Affiliates Working group, which now consists of Merlijn van Rijswijk, Craig Wheelock, and myself, and we are busy discussing new affiliates from across the globe. Most recently we've been in discussions with groups from the UK, Italy, South Africa, and Mexico. So the abstract deadlines are open until the 10th May and I encourage you all to come to Brisbane and be part of the international meeting of our Society. Strewth, I can almost taste the beer in the 'cold tinnie'. Watch this space for the EMN reception details being held on Tuesday, June 27th at 7PM where we are planning on creating a lot of fun and games allowing early career members to socialize and network! The EMN webinar series continued in March and our speaker was Dr. Stephan Hann from BOKU, Vienna. His talk, titled “How well do I quantify? Concepts for method validation and evaluation of measurement uncertainty in metabolomics,” focused on the quantitation strategies for LC- and GC-based metabolomics. The webinar can be accessed here. Please note that this webinar is available for free to everyone courtesy of the Metabolomics Society and will be uploaded to the society's website. All subsequent sessions from our series will only be available for members of the Metabolomics Society with the opportunity to revisit live recorded sessions at your own convenience. Make sure to check the Metabolomics Society website, Twitter, Facebook for updates on the webinar. The Australian and New Zealand Society for Mass Spectrometry (ANZSMS) will hold their 26th bi-annual Conference in Adelaide in July 2017. Themes of the meeting include both metabolite and lipid analysis. The meeting aims to provide a forum for the presentation of research in mass spectrometry and its related disciplines and to develop networks between local and international participants in all areas, from academia to industry. Dating back to 1971, ANZSMS26 is the premier conference for mass spectrometry in the Australia & New Zealand region and always receives a high number of quality presentations. View the event flyer at https://www.dropbox.com/s/bht0xst4s3mv6vl/ANZSMS%2Bflyer.pdf?dl=0. To learn more, please visit http://www.aomevents.com/ANZSMS26. The French Society of Mass Spectrometry, the French Network of Metabolomics and Fluxomics, and the French Society of Electrophoresis and Proteomic Analysis are happy to introduce the first joint conference SMMAP 2017 (Mass Spectrometry, Metabolomics and Proteomic Analysis 2017). The local organizing committee will welcome you at the New York Hotel® (Disneyland® Paris, Marne-la-Vallée-Chessy) from Tuesday 3 to Thursday 5 October 2017. A satellite meeting will be organized on Monday, 2 October, for training activities, round tables and a young researchers' meeting. This unique event, which will host more than 450 participants, will foster interdisciplinary, as well as scientific exchanges between communities that traditionally meet separately. It will also be an opportunity to broaden our knowledge, share experiences, and create new links, both scientific and personal. The conference will also welcome scientists from the private sector, working on instrumentation, sample preparation, and data processing. The exposome is defined as an individual's total exposure to various chemical compounds over the course of a lifetime [1,2]. Its characterization is essential in molecular epidemiology to understand the role of lifestyle, diet, and other environmental exposures on the risk of various diseases. Blood, urine, and other biospecimens collected in cohort studies contain hundreds to thousands of compounds directly derived from dietary compounds, pollutants, and other contaminants that are all potential indicators of exposures [3,4]. Exposome-Explorer (http://exposome-explorer.iarc.fr) is the first database dedicated to biomarkers of exposure to environmental risk factors for diseases . It contains detailed information on the nature of biomarkers, populations, and individuals whose biomarkers have been measured, samples analysed, methods used for biomarker analyses, concentrations in biospecimens, correlations with external exposure measurements, and biological reproducibility over time (Figure 1). Figure 1. Screenshot montage of a biomarker view. Distinct areas are shown: structure and chemical information (A), concentrations (B), correlations (C), and reproducibility (D) collated from several publications. 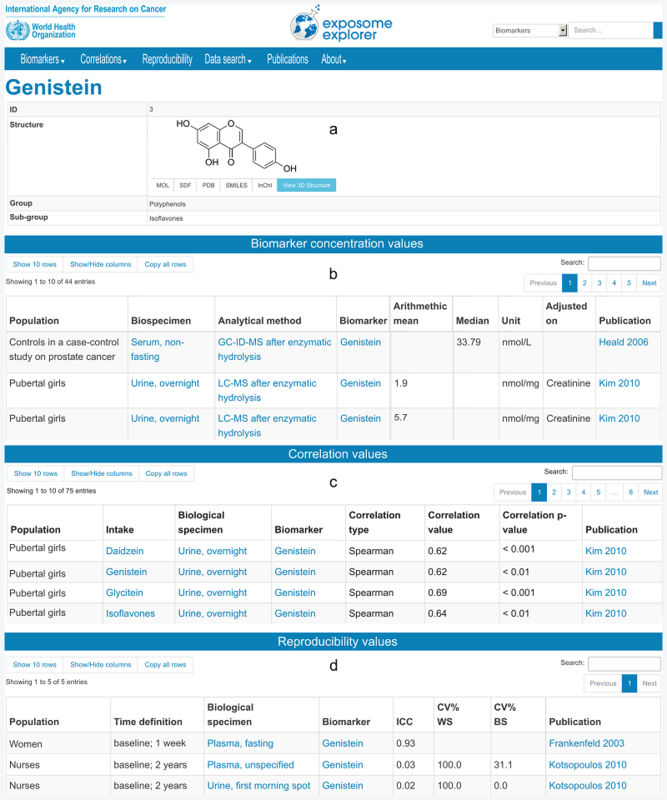 Details on populations, biospecimens, analytical methods, and corresponding citations are displayed. More fields can be displayed with the 'Show/Hide columns' button. Reproduced from Neveu V. et al., Nucl. Acid Res. 2017, 45, D979-D984. The data in Exposome-Explorer was manually collected from peer-reviewed publications. A total of 480 publications were analyzed and 10,510 concentration values in blood, urine, and other biospecimens for 692 dietary and pollutant biomarkers were collected (Figure 2). The database also contains 8,034 correlation values between dietary biomarker levels and food intake, and 536 values of biological reproducibility over time. These data are valuable indicators of the quality of a biomarker. Figure 2. 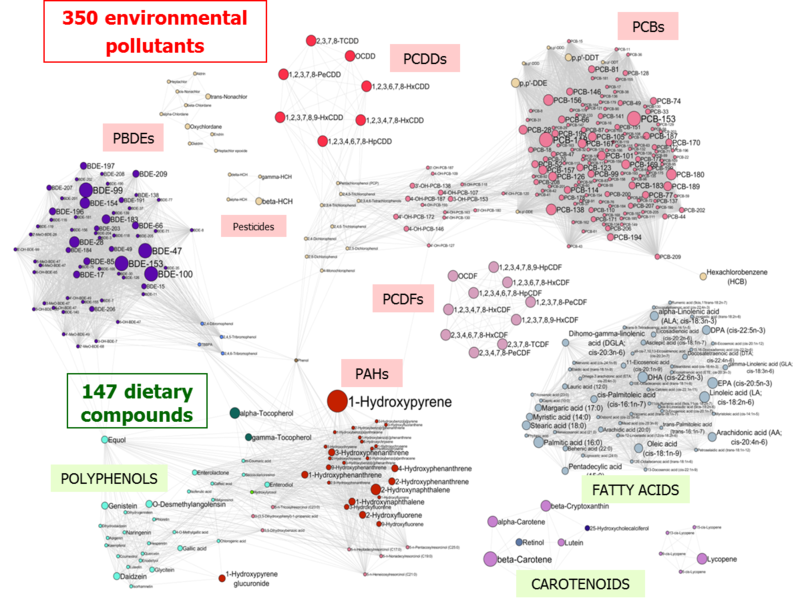 Dietary and pollutant biomarkers in Exposome-Explorer. Exposome-Explorer should be useful for researchers interested in identifying the common and most useful indicators of exposures in metabolic profiles acquired during metabolomic studies. It can also be used to select panels of biomarkers to measure complex exposures in exposome-wide association studies. New data on candidate biomarkers, measured in both observational and intervention studies, are now being added to the database. Data on associations of biomarkers of exposures with diseases or surrogate markers will also be collected. Wild, C.P., Complementing the genome with an "exposome": The outstanding challenge of environmental exposure measurement in molecular epidemiology. Cancer Epidemiology Biomarkers & Prevention, 2005. 14(8): p. 1847-1850. Rappaport, S.M. and M.T. Smith, Environment and Disease Risks. Science, 2010. 330(6003): p. 460-461. Rappaport, S.M. et al., The blood exposome and its role in discovering causes of disease. Environ Health Perspect, 2014. 122(8): p. 769-74. Scalbert, A. et al., The food metabolome – A window over dietary exposure. American Journal of Clinical Nutrition, 2014. 99: p. 1286-1308. 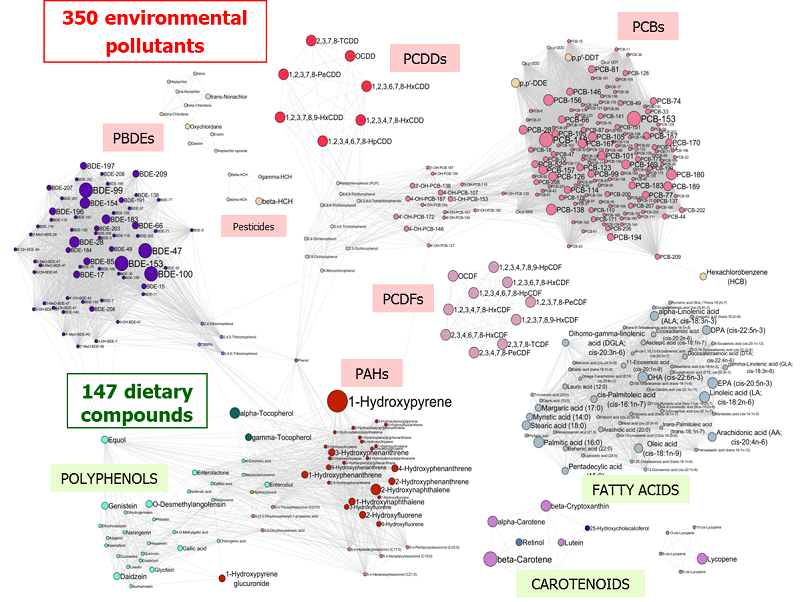 Neveu, V. et al., Exposome-Explorer: a manually-curated database on biomarkers of exposure to dietary and environmental factors. Nucleic Acids Research, 2017. 45(D1): p. D979-D984. This section features interviews with prominent researchers in the field of metabolomics. The aim of these interviews is to shed light on metabolomics researchers around the world and give them an opportunity to share their metabolomics story. In this issue, we feature an interview with Kati Hanhineva. Kati Hanhineva, PhD, Academy Research Fellow, is group leader at the School of Medicine, Department of Public Health and Clinical Nutrition at the University of Eastern Finland, Kuopio, Finland. 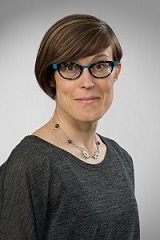 She completed her PhD in plant biotechnology at the University of Kuopio in 2008, and conducted post-doctoral research at the Department of Public Health and Clinical Nutrition in projects related to the beneficial health effect of whole grain rich diets, before becoming a group leader at the same department. Currently her research group’s main interests are in the area of phytochemical diversity of plant-rich foods, and the impact of colonic microbiota on those, as well as the metabolic alterations they subsequently evoke in mammalian metabolism. KH: During the latter part of my PhD work, on several occasions, I visited the laboratory of Dr. Asaph Aharoni at the Weizmann Institute (Israel) and got familiarized with non-targeted metabolite profiling utilizing LC-MS. The approach was crucial for the successful outcome of my research project and I was completely fascinated by the technology. I have utilized metabolomics in all my research work since then, and together with Prof. Seppo Auriola, established an analytical unit at the University of Eastern Finland in 2010. KH: The most exciting part clearly is the ability to make novel discoveries. The discovery of novel compounds or some interesting metabolic phenomena related to one's research question perfectly satisfies the natural born curiosity of a researcher! Another aspect is naturally the wealth of information that one can gain from a single analysis, as well as the challenges related to it, including various stages of data processing and the actual output and visual presentation of the results. KH: My group is mainly interested in looking at the impact of phytochemical rich diets on human health and the role of microbiota as a mediator. We are particularly interested in identifying the microbiota-produced metabolites from foodstuff and many of our current collaborative projects are in this area. We aim to identify the branches of endogenous metabolism that typically reflect dietary changes and, therefore, could be responsible for health-related effects of diet. Another key aspect is the development of data analytical procedures that we currently are conducting in collaboration with research groups in computational metabolomics. KH: During past years, several novel metabolomics facilities have been established utilizing both targeted and non-targeted approaches, for example, in plant research. There is also very strong community within health technology showing interest towards novel technologies enabling deeper biochemical examination of humans, and clearly metabolomics is one of those. Our unit is currently spinning-out the metabolomics services as a start-up company to respond to the increased demand. In NMR-based metabolomics, there has been successful commercialization (Nightingale Health, https://nightingalehealth.com/), and the company is focusing on implementing NMR metabolomics on clinical applications worldwide. KH: Currently, we are putting major efforts into workflow optimization and maximizing the coverage of metabolites, by utilizing multiple analytical modes. We aim to have a uniform, comprehensive approach for easy-to-adopt metabolomics analyses, which would facilitate high throughput analytical services. KH: Non-targeted profiling is essentially the only approach that allows one to discover unanticipated metabolic alterations, related to any research question. This approach is extremely important for basic research. Another strength is the coverage of compounds, which holds vast potential for implementation in the healthcare system, most likely through semi-targeted applications. KH: At the moment, the barriers relate to the wealth of data obtained and the procedures used to treat the data. Already the feature collection is extremely demanding; in order to achieve clear, neat data matrices containing compounds, not redundant metabolite features, a great deal of development is required. Additionally, the identification of completely novel compounds that typically arise from every non-targeted metabolite profiling assay continues to be a challenge. KH: Hardware is improving on a continual basis and, thanks to these improvements, biochemicals can be detected with better sensitivity and accuracy than ever before. Also, developments in the computational approaches are ongoing on various aspects of data analysis including the identification of unknown compounds. The next step is to successfully implement the best possible data analytical practices and algorithms with the aim of producing high quality analytical data. However, more efficient interaction between the metabolomics end users and the developers of the computational algorithms is needed. KH: It is one of the fastest growing areas in the biosciences, so I suppose the funding continues to be basically secure. I would say that, for most research projects, the inclusion of metabolomics experiments is favourable in terms of successful grant applications. KH: There are various aspects of metabolomics that would benefit from standardization, for example, reporting the analytical conditions, unifying the data processing practices, and presenting the data related to compound identification. At the moment, these procedures are diverse, but luckily there are various ongoing initiatives on metabolomics standardization. Hopefully they will become part of routine practice in metabolomics research in the future. KH: I am happy to be able to utilize this exciting technology in my research, develop it further, and am curious to see how the area evolves in the future! Comprehensive metabolomics identified lipid peroxidation as a prominent feature in human plasma of patients with coronary heart diseases. Metabolite Spectral Accuracy on Orbitraps. Simultaneous Quantification of Amino Metabolites in Multiple Metabolic Pathways Using Ultra-High Performance Liquid Chromatography with Tandem-mass Spectrometry. Metabolomic profiling of ascending thoracic aortic aneurysms and dissections - Implications for pathophysiology and biomarker discovery. Synergic effects of sugar and caffeine on insulin-mediated metabolomic alterations after an acute consumption of soft drinks. Metabolic profiling discriminates between strawberry (Fragaria×ananassa Duch.) cultivars grown in Finland or Estonia. A Metabolomics Study of the Effects of Inflammation, Hypoxia, and High Glucose on Isolated Human Pancreatic Islets. Metabolic profiles in heart failure due to non-ischemic cardiomyopathy at rest and under exercise. The Critical Assessment of Small Molecule Identification (CASMI) Contest  was founded in 2012 as an open contest for the experimental and computational mass spectrometry communities. Subsequent CASMI contests were held in 2013, 2014, and 2016. The last contest had one category with natural product spectra targeting manual approaches (see Phytochemistry Letters ). Two new categories for automated methods revealed 34% (no metadata) to 80% (with metadata) challenges ranked first (see Journal of Cheminformatics ). Now in 2017, you are invited to participate in the fifth round of CASMI . The contest offers challenges for manual and automated approaches. Most challenges are plant-derived compounds, with a few endogenous to humans, including some less-well-known substances to keep participants on their toes. Everyone is welcome to participate; we look forward to another exciting contest! Check out the website and contact us at casmi-team2017@lists.sf.net if you have any questions. This 4-week course will introduce you to metabolomics using a combination of videos, short articles, discussion points and self-assessment quizzes. The course will investigate the advantages and challenges of studying the metabolome, and the interdisciplinary approaches that have driven the development of the metabolomics field. To facilitate your understanding of the subject you will have the opportunity to interact with your fellow learners and the team of educators (led by Professor Mark Viant and Dr Warwick Dunn) on the discussion forums. Study time: 4 weeks, 3 hours study time per week. The course is aimed at final year undergraduate science students and research scientists but will provide a valuable introduction to the metabolomics field for scientists at any stage in their careers.